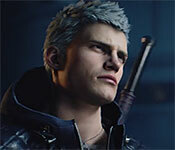 Devil May Cry 5 is a action adventure game for all of the action game fans. In the game, the player's character is a warrior, who needs to find those forgotten demons and kill the demons who destroy the peace of the world. Of course, the player is not alone in the battle, there will be many different characters to help the player, with the help of these partners, in many dangerous places, the player can easily pass. Devil May Cry 5 is an AAA-level masterpiece developed and released by CAPCOM Co., Ltd. Such a masterpiece certainly requires a very powerful computer to drive it up, so look at its minimum configuration requirements: the operating system is a 64-bit system above Windows 7, CoreTM i5-4460 or AMD FXTM-6300 or higher processor, 8GB of RAM, NVIDIA GeForce GTX 760 or AMD RadeonTM R7 260x with 2GB Video RAM, or higher, DirectX requires version 11, hard drive requires 35GB of space, my god, it really needs a High-level configuration of my computer to run this masterpiece. The game includes 2 versions, Standard Edition and DELUXE EDITION. In the DELUXE EDITION, in addition to the most basic game plays, it also includes: 4 exclusive Devil Breaker weapons, Live Action Cutscenes, 12 tracks of battle music from Devil May Cry 1- 4 and Alt Style Rank Announcers and Title Calls. The plot performance of the game is very attractive. Each piece of cutscenes is like a movie film, which is a very good connection to the story of the game. This is very easy to get started. The game supports the handle and keyboard/mouse operation. The control of the player's character is very flexible. With the gorgeous and smooth fighting screen, it is really a pleasure to play. Action game enthusiasts, don't miss such a great game, we give it a score of 5 points. Sign-up to get informed when the Devil May Cry 5 series has new game released with BD Studio Games' FREE bi-weekly newsletter.